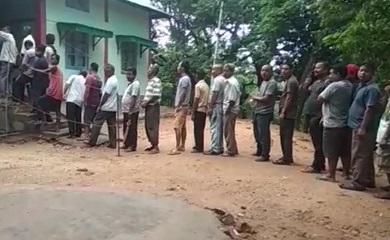 Amid tight security, voting is underway for the by-polls of two Assembly constituencies – South Tura and Ranikor in Meghalaya. 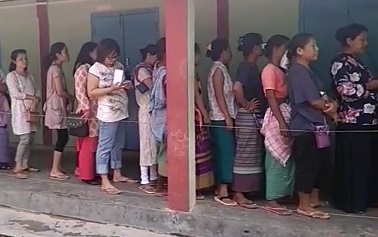 Chief Election Officer of Meghalaya F R Kharkongor has informed that about 7.5 per cent votes were cast in the first two hours in the by-elections to the two Assembly constituencies. While the voter turnout till 9 am was less than 5 per cent in Ranikor seat, in South Tura constituency it was a little over 10 per cent, the official said. Polling began at both the constituencies at 7 am and it will end at 5 pm in both the constituencies. However, voters started pouring in from around 8 am in the morning. State Chief Minister Conrad Sangma, who is also the national chief of the National People’s Party (NPP), is contesting the by-election and is hopeful to win the South Tura assembly seat in order to retain his chief ministership. Agatha Sangma resigned as member from South Tura Assembly seat to pave way for her brother Conrad to contest the by-election. Conrad is pitted against Congress candidate Charlotte W Momin, John Leslee K Sangma and Kris Kabul A Sangma (both Independents). The Ranikor Assembly seat fell vacant after former Public Works Department Minister and five-time Congress legislator from Ranikor constituency, Martin Dango, resigned as member of the State Assembly and joined the ruling NPP after the government announced the creation of Ranikor Civil Sub-Division last month. Dango who is seeking re-election is pitted against three candidates – Congress’ Jacquish A Sangma, United Democratic Party’s Pius Marwein and People’s Democratic Front’s P N Syiem. Notably, the Bharatiya Janata Party (BJP), which is part of the NPP-led Meghalaya Democratic Alliance government, has decided not to contest the by-polls and support the NPP candidate Conrad from South Tura Assembly seat and remain neutral for the Ranikor by-polls.